The Level 2 Certificate in Maritime Studies: Engine Room Rating will develop knowledge and skills in areas such as maritime employment, environmental and health and safety practice, survival in the water during maritime emergencies, vessel fire prevention and fire-fighting, and maritime security. The Diploma also includes emergency first aid in response to maritime accidents or medical emergencies, safe operation of merchant vessel machinery systems, electrical safety on merchant vessels, and producing components using hand-fitting techniques. The Level 2 Certificate in Maritime Studies: Engine Room Rating is suitable for people who are working, or intending to work, in the maritime sector. It is aimed at those who have no prior experience of the sector. Learners will develop their skills and knowledge as ratings in the engine room of a merchant vessel or tug to ensure the continuous running of machinery and equipment on board the vessel. They will learn to organise routine maintenance procedures and necessary repairs in the engine-room, on power plant and on auxiliary machinery. 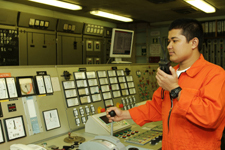 The primary purpose of this qualification is to confirm the learner’s occupational competence as an engine room rating. As a work-related, competence-based qualification it provides confirmation to employers and industry managers that the learner has the skills and knowledge needed to meet the nationally recognised standard to carry out the role. The qualification is intended for people in the maritime sector and has been developed in conjunction with the Merchant Navy Training Board and the Maritime and Coastguard Agency to ensure it is ‘fit for purpose’. To gain the qualification, learners must complete eight mandatory units (credit value 27) from the qualification structure. This qualification provides the opportunity to progress to further learning or more senior positions including that of bosun or senior rating (deck or engine room) on super yachts and other vessels that require limited certification. The Level 2 Certificate in Maritime Studies: Engine Room Rating consists of eight mandatory units (credit value 27). Please refer to the qualification structure (82 KB) for more information.